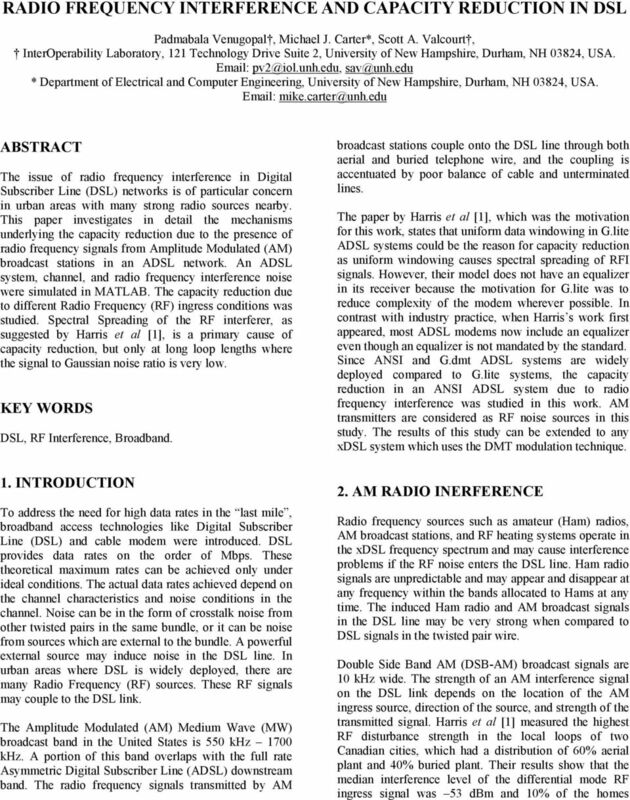 Download "RADIO FREQUENCY INTERFERENCE AND CAPACITY REDUCTION IN DSL"
2 experienced interference of 37dBm or higher . The RF ingress level in a buried plant is only 4 db below the aerial plant ingress levels . Harris s  paper shows that the interference signal may be as strong as the DSL signal at the tones where the AM ingress signal s spectrum overlaps with the DSL signal. Constellation Encoding IFFT ATU-C Cyclic Prefix K H(w) The radio frequency interference will affect the front end of the ADSL system. There are possibly non-linear and linear effects which may be caused by RFI. These effects may reduce the link capacity. Error Checking Constellation Decoding FEQ FFT G TimeDomain Equalizer AWGN + HDSL + RFI Noise Non-linear effects ) The common mode rejection ratio of the front-end amplifier determines the extent to which the common mode signal is cancelled. Inadequate cancellation of the common mode signal may reduce the effective dynamic range of the analog to digital converter, and may cause a decrease in the overall Signal to Noise Ratio (SNR) by activating the automatic gain control. ) Intermodulation products in the band of ADSL may appear in the front-end amplifier. Linear effects ) Implicit rectangular windowing in DFT demodulation causes spectral spreading of the narrow band interferer. ) Direct interference to tones within bandwidth of interferer. Only linear impairments are studied in this work. 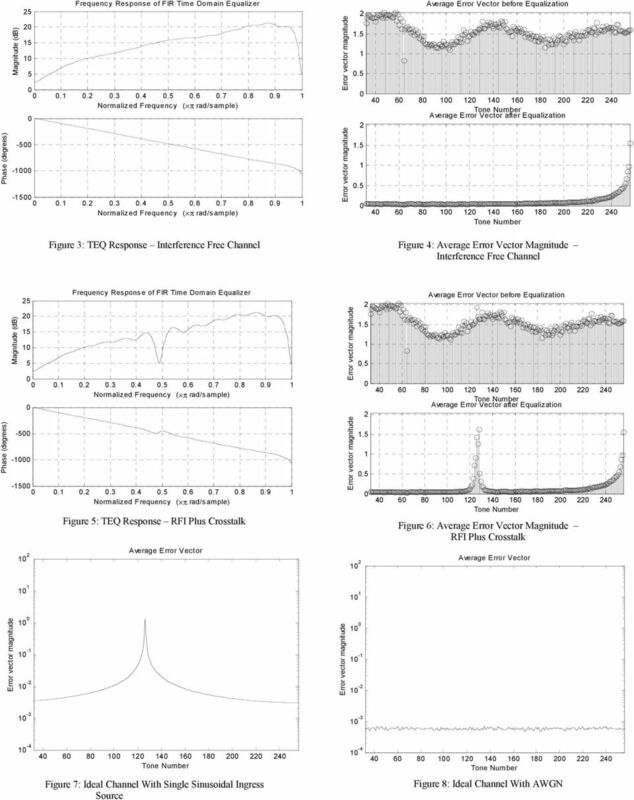 The following issues are analyzed in this study: ) The role of a time domain equalizer in RFI cancellation. ) The issue of rectangular windowing versus nonuniform windowing. 3) RFI cancellation using a bandstop filter. 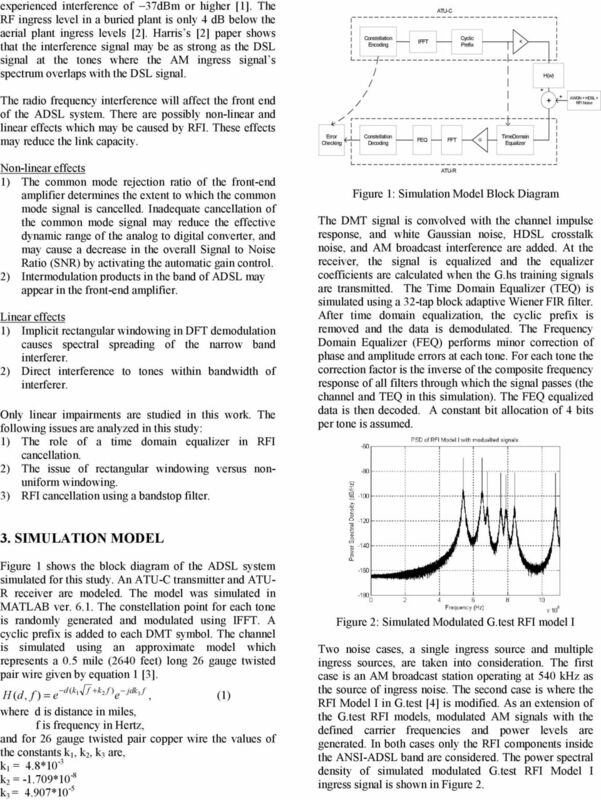 ATU-R Figure : Simulation Model Block Diagram The DMT signal is convolved with the channel impulse response, and white Gaussian noise, HDSL crosstalk noise, and AM broadcast interference are added. At the receiver, the signal is equalized and the equalizer coefficients are calculated when the G.hs training signals are transmitted. The Time Domain Equalizer (TEQ) is simulated using a 3-tap block adaptive Wiener FIR filter. After time domain equalization, the cyclic prefix is removed and the data is demodulated. The Frequency Domain Equalizer (FEQ) performs minor correction of phase and amplitude errors at each tone. For each tone the correction factor is the inverse of the composite frequency response of all filters through which the signal passes (the channel and TEQ in this simulation). The FEQ equalized data is then decoded. A constant bit allocation of 4 bits per tone is assumed. 3. SIMULATION MODEL Figure shows the block diagram of the ADSL system simulated for this study. An ATU-C transmitter and ATU- R receiver are modeled. The model was simulated in MATLAB ver. 6.. The constellation point for each tone is randomly generated and modulated using IFFT. A cyclic prefix is added to each DMT symbol. The channel is simulated using an approximate model which represents a.5 mile (64 feet) long 6 gauge twisted pair wire given by equation . d ( k f + k f ) jdk f 3 H ( d, f ) = e e, () where d is distance in miles, f is frequency in Hertz, and for 6 gauge twisted pair copper wire the values of the constants k, k, k 3 are, k = 4.8* -3 k = -.79* -8 k 3 = 4.97* -5 Figure : Simulated Modulated G.test RFI model I Two noise cases, a single ingress source and multiple ingress sources, are taken into consideration. The first case is an AM broadcast station operating at 54 khz as the source of ingress noise. The second case is where the RFI Model I in G.test  is modified. As an extension of the G.test RFI models, modulated AM signals with the defined carrier frequencies and power levels are generated. In both cases only the RFI components inside the ANSI-ADSL band are considered. The power spectral density of simulated modulated G.test RFI Model I ingress signal is shown in Figure. 3 Capacity Reduction Metric The capacity reduction is studied with two metrics: () the Euclidean distance between the transmitted constellation point and the received constellation point for each tone, and () the number of tones in error. The Euclidean distance method gives a better understanding of the magnitude of error. This distance is the length of the error vector in signal space. If the error vector is larger, then the probability for the tone to be decoded incorrectly is greater. If the error vector is small, then the data may be accurately recovered with error correction methods. For the second metric, a tone is decided to be in error if the received signal is decoded to be a constellation point which is different from the transmitted constellation point. The Euclidean distance between the recovered data point and all possible constellation points is calculated. The received data is decoded as the constellation point which has the shortest distance to the received data point. Error checking is not done in terms of bits in error, as no error checking and error correction features are embedded in this simulation. 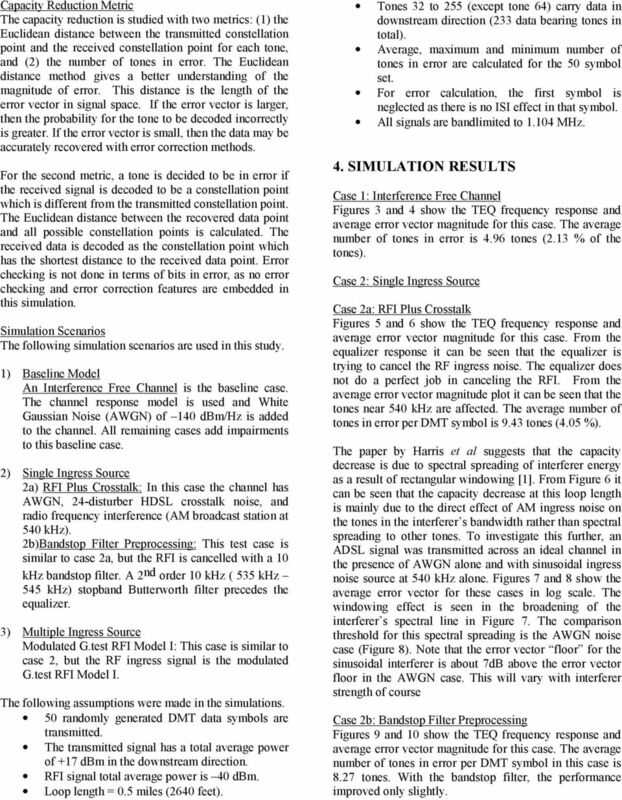 Simulation Scenarios The following simulation scenarios are used in this study. ) Baseline Model An Interference Free Channel is the baseline case. The channel response model is used and White Gaussian Noise (AWGN) of 4 dbm/hz is added to the channel. All remaining cases add impairments to this baseline case. ) Single Ingress Source a) RFI Plus Crosstalk: In this case the channel has AWGN, 4-disturber HDSL crosstalk noise, and radio frequency interference (AM broadcast station at 54 khz). b)bandstop Filter Preprocessing: This test case is similar to case a, but the RFI is cancelled with a khz bandstop filter. A nd order khz ( 535 khz 545 khz) stopband Butterworth filter precedes the equalizer. 3) Multiple Ingress Source Modulated G.test RFI Model I: This case is similar to case, but the RF ingress signal is the modulated G.test RFI Model I. The following assumptions were made in the simulations. 5 randomly generated DMT data symbols are transmitted. The transmitted signal has a total average power of +7 dbm in the downstream direction. RFI signal total average power is 4 dbm. Loop length =.5 miles (64 feet). Tones 3 to 55 (except tone 64) carry data in downstream direction (33 data bearing tones in total). Average, maximum and minimum number of tones in error are calculated for the 5 symbol set. For error calculation, the first symbol is neglected as there is no ISI effect in that symbol. All signals are bandlimited to.4 MHz. 4. SIMULATION RESULTS Case : Interference Free Channel Figures 3 and 4 show the TEQ frequency response and average error vector magnitude for this case. The average number of tones in error is 4.96 tones (.3 % of the tones). 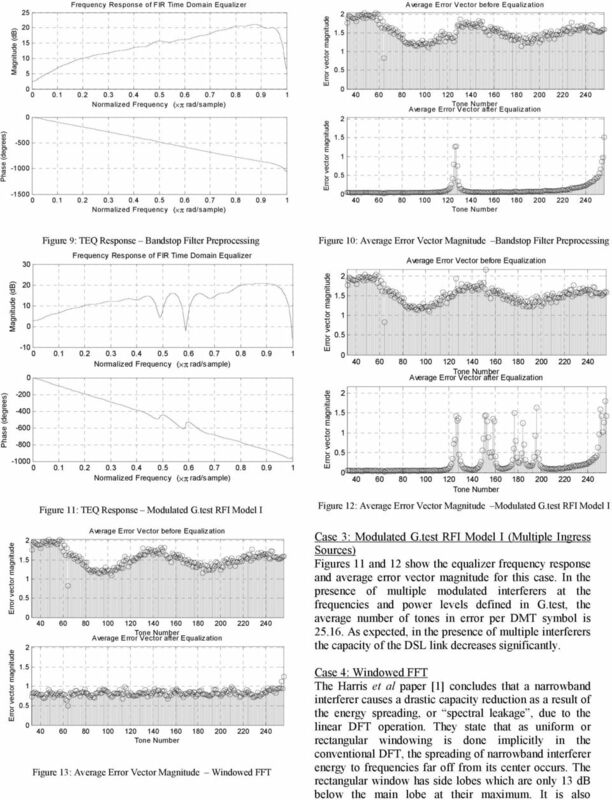 Case : Single Ingress Source Case a: RFI Plus Crosstalk Figures 5 and 6 show the TEQ frequency response and average error vector magnitude for this case. From the equalizer response it can be seen that the equalizer is trying to cancel the RF ingress noise. The equalizer does not do a perfect job in canceling the RFI. From the average error vector magnitude plot it can be seen that the tones near 54 khz are affected. The average number of tones in error per DMT symbol is 9.43 tones (4.5 %). The paper by Harris et al suggests that the capacity decrease is due to spectral spreading of interferer energy as a result of rectangular windowing . From Figure 6 it can be seen that the capacity decrease at this loop length is mainly due to the direct effect of AM ingress noise on the tones in the interferer s bandwidth rather than spectral spreading to other tones. To investigate this further, an ADSL signal was transmitted across an ideal channel in the presence of AWGN alone and with sinusoidal ingress noise source at 54 khz alone. Figures 7 and 8 show the average error vector for these cases in log scale. The windowing effect is seen in the broadening of the interferer s spectral line in Figure 7. The comparison threshold for this spectral spreading is the AWGN noise case (Figure 8). Note that the error vector floor for the sinusoidal interferer is about 7dB above the error vector floor in the AWGN case. This will vary with interferer strength of course Case b: Bandstop Filter Preprocessing Figures 9 and show the TEQ frequency response and average error vector magnitude for this case. The average number of tones in error per DMT symbol in this case is 8.7 tones. With the bandstop filter, the performance improved only slightly. 6 suggested by Harris et al  that using other window functions might improve the achievable data rate. Windows other than the rectangular window do not have nulls at f s /N [5, cf. pg 84 Figure 3-6]. This causes major problems in taking the FFT because immediately adjacent tones are not nulled out by these windows. The interference free channel case was run with windowing at the receiver and one can see how plainly applying windowing will not help in recovering the data. A Hanning window was used to perform the windowed FFT. The average number of tones in error per DMT symbol in this case is tones. Figure 3 shows the average error vector magnitude for this case. Case Number of Tones in Error Average Tones % Max Interference Free Channel RFI Plus Crosstalk Bandstop Filter Preprocessing Modulated RFI Model I Min Windowed FFT Table : Capacity Reduction Table summarizes the capacity reduction in terms of number of tones in error. All simulations were run with the transmitted DMT signal average power of about 7dBm and a loop length of.5 mile. When the RFI Plus Crosstalk case was rerun with a DMT symbol of power dbm, the average capacity reduction was 9. tones per DMT symbol. As the number of interference sources increases, the capacity reduction increases. When the G.test multiple interferer model is used, the modulated noise case causes greater capacity reduction than the unmodulated noise case. To see how the loop length affects the capacity in the presence of RFI, the RFI plus crosstalk case with modulated G.test RFI noise was run for loop lengths of.5,.5 and mile. From the results in Table one can see that as distance increases, the DSL link capacity decreases. Number of Tones in Error Distance Average (mile) Maximum Minimum Tones % Table : Capacity Reduction vs. Loop Length Modulated G.test RFI Model I 5. CONCLUSION From the analysis of the results obtained, it is seen that spectral spreading of the narrowband interferer due to rectangular windowing is a cause of capacity reduction, but only at long loop lengths where the signal to Gaussian noise ratio is very low. It is also shown that directly applying other windows does not help in reducing the spectral spreading of the interferer. For a more detailed discussion of simulation cases and background work, refer to reference . 6. 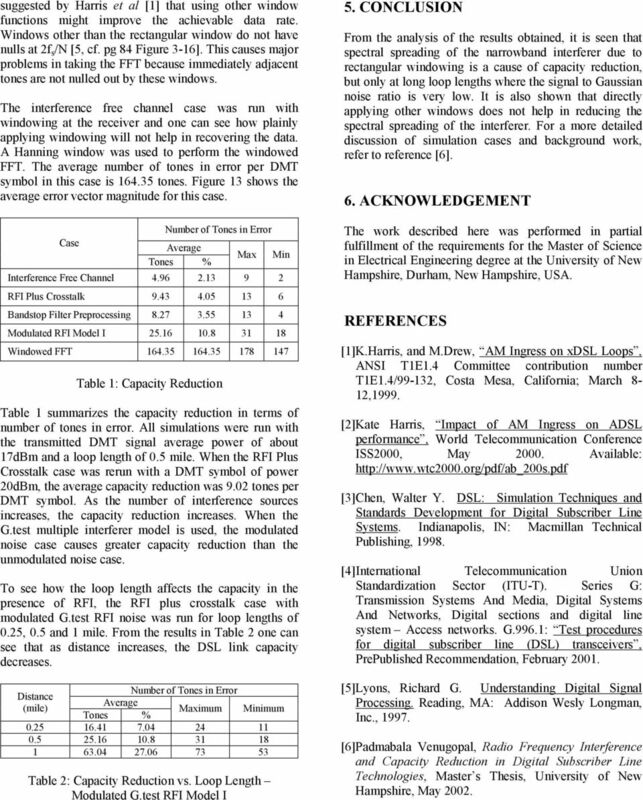 ACKNOWLEDGEMENT The work described here was performed in partial fulfillment of the requirements for the Master of Science in Electrical Engineering degree at the University of New Hampshire, Durham, New Hampshire, USA. REFERENCES K.Harris, and M.Drew, AM Ingress on xdsl Loops, ANSI TE.4 Committee contribution number TE.4/99-3, Costa Mesa, California; March 8-,999. Kate Harris, Impact of AM Ingress on ADSL performance, World Telecommunication Conference ISS, May. Available: Chen, Walter Y. DSL: Simulation Techniques and Standards Development for Digital Subscriber Line Systems. Indianapolis, IN: Macmillan Technical Publishing, 998. International Telecommunication Union Standardization Sector (ITU-T). Series G: Transmission Systems And Media, Digital Systems And Networks, Digital sections and digital line system Access networks. G.996. : Test procedures for digital subscriber line (DSL) transceivers, PrePublished Recommendation, February. Lyons, Richard G. Understanding Digital Signal Processing. Reading, MA: Addison Wesly Longman, Inc., 997. Padmabala Venugopal, Radio Frequency Interference and Capacity Reduction in Digital Subscriber Line Technologies, Master s Thesis, University of New Hampshire, May. Orion2+ SHDSL.bis Solution with 11Mbit/s and 15Mbit/s per Copper Pair Good to Know about Orion s Orion1 and Orion2 Modems from FlexDSL have always some more features than corresponding products from competitors. DSL Variations. NEXTEP Broadband White Paper. Broadband Networks Group. Definitions and differences of Digital Subscriber Line variations. ADSL TUTORIAL. Figure 1: Typical DSL system. Introduction to ADSL. NEXTEP Broadband White Paper. Broadband Networks Group. A primer on Asymmetric Digital Subscriber Line transmission technology. FROM POTS TO VDSL - TECHNICAL ASPECTS OF A REASONABLE MIGRATION STRATEGY Günther Komp, Thomas Kessler, Mathias Friese, Werner Henkel Deutsche Telekom AG, Am Kavalleriesand 3, D-64295 Darmstadt Abstract.